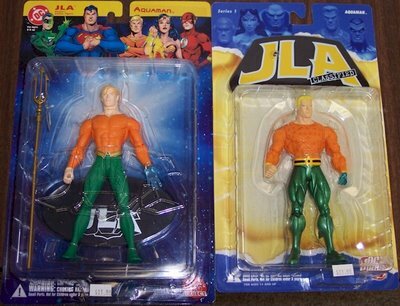 Okay, pop quiz: What's the difference between these 2 Aquaman action figures? (I mean besides the fact that the one on the right, based on designs by Ed McGuinness, looks like it could launch a congressional hearing on steroid abuse among Justice League members. Seriously, just take a look at his teammates). That's right. The figure on the left is intended "for ages 8 and up," while the one on the right is intended "for ages 14 and up." Both action figures depict Aquaman. Both are part of a JLA series. Both were made by DC Direct. But between them there is a 6-year maturity gap of some sort. Try to imagine that your son (or daughter -- I'm not sexist) is a huge fan of Cartoon Network's soon-to-be-defunct Justice League Unlimited cartoon, and on his 8th birthday you take him to the local comic shop to spend the birthday money he received from relatives. And for some reason that you can't quite fathom (get it? fathom? 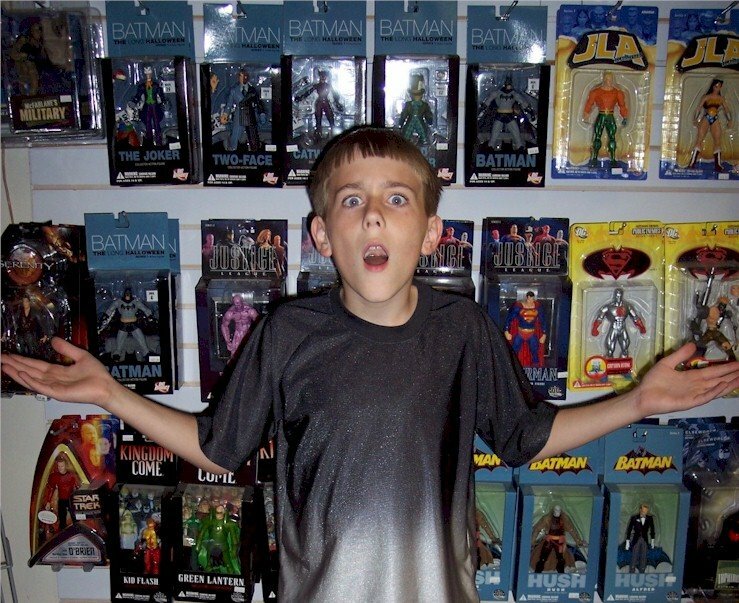 ), he decides he wants an Aquaman action figure. (He's only 8... there's no accounting for taste. But what's the WB's excuse? Seriously, Mercy Reef? Is it really necessary to prove you can sink lower than Smallville?) You tell him he can have the one on the left, but for the one on the right, he'll have to wait another six years. Now there's something that will make him look forward to his 14th birthday. And that's despite the fact that the figure intended for younger children comes with a dangerously pointy trident accessory that your son could poke out his eye with (or stick down his throat, or shove up his nose into his brain). How does that make any sense? 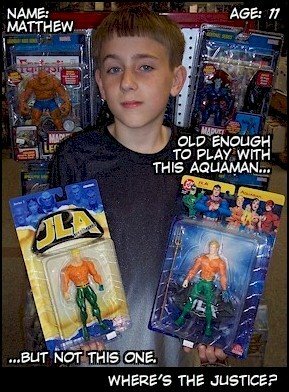 Worse still, he then comes to his senses and realizes that there are far cooler action figures on display than Aquaman... but then discovers that the vast majority of them are beyond his appropriate age range. All the cool series are: Kingdom Come, Batman: The Long Halloween, Hush, Justice, Batman/Superman, (not to mention anything made by McFarlane Toys)... all out of reach for six more years. Seriously, if that hypothetical 5-year-old has a hypothetical younger sibling, this action figure is effectively a lethal weapon in his hands. 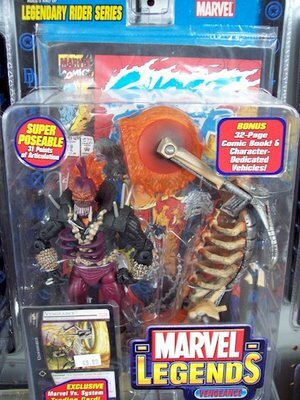 If someone can explain to me the logic behind DC Direct's labeling system, I would be much obliged. 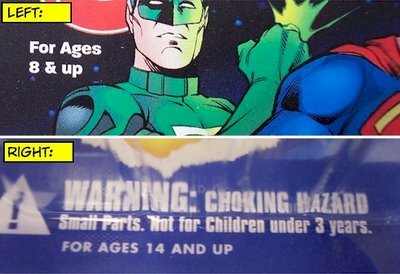 I think the Choking Hazard warning, explaining that the toys aren't for kids under 3, should be quite sufficient. Beyond that, I have a hard time imagining any superhero action figure that could be considered inappropriate for someone between the ages of 8 and 14. And yes, this is exactly the sort of thing I spend my workday thinking about. Seriously, though, you make a damn fine point. I hereby join you in requesting a reasonable explanation for the rational at work here. Anyone at D.C. Direct listening out there?